Kingfisher07854 350214work Self-cateringANNEXE AVAILABLE - PLEASE ENQUIRE WITH AGENTS. NO PETS. NO SMOKING IN HOUSE. WIFI . FREEVIEW. FLATSCREEN TV/DVD's. FRIDGE/FREEZER. MICROWAVE. DISHWASHER/DRIER. BED LINEN/TOWELS INC. ELECT/GAS CH INCLUDED. COT/HIGH CHAIR. BBQ. GARDEN FURNITURE. BREAKAGE DEPOSIT OF £100. Kingfisher is a detached bungalow in a quiet residential area of the town, only a few minute's walk from the cliff tops and the fabulous panoramic views of the Wash and it's infamous West facing sunsets. The Golf Links at Old Hunstanton are minutes away as are the local pubs and restaurants in this popular village. Hunstanton town itself is seconds by car and a lovely cliff top walk of about 15 minutes will take you all holiday amenities. Very well equipped throughout with wooden floors and fully tiled ensuites, the luxury accommodation caters for 5 plus baby with the addition of an annexe if required (please note that this is not available separately and the owners may use it themselves). Being the owner's home it is tastefully furnished to an excellent standard throughout with gas central heating, Freeview TV's in most rooms and wi-fi access. Ample off road parking is available and the pleasant, enclosed rear garden is perfect for eating 'al fresco' with it's lawn and decking area. Catering for 5 plus baby, the light and airy accommodation comprises; Entrance lobby into hall; Modern kitchen with large 'Flavel' cooker - gas hob (8 rings) and double oven plus grill, patio doors on to raised decking and rear enclosed garden. Beautiful lounge with TV/dvd, door into conservatory/dining area, in turn leading on to garden. Three bedrooms; Bedroom one with twin beds (can be zipped into large double), family bathroom with bath (shower over), WC and washbasin. Bedroom 2, having a single bed and TV, Bedroom 3 with double bed. Each have ensuite shower rooms with cubicle, WC and washbasin. Childrens playroom/nursery with TV (for dvd's only, no programmes), games, toys and room for cot. ANNEXE AVAILABLE - PLEASE ENQUIRE WITH AGENTS. NO PETS. NO SMOKING IN HOUSE. WIFI . FREEVIEW. FLATSCREEN TV/DVD's. FRIDGE/FREEZER. MICROWAVE. DISHWASHER/DRIER. BED LINEN/TOWELS INC. ELECT/GAS CH INCLUDED. COT/HIGH CHAIR. BBQ. GARDEN FURNITURE. BREAKAGE DEPOSIT OF £100. Beautiful annexe with private entrance having double bed, TV, shower room with corner shower, WC and washbasin. Minimal kitchen facilities. 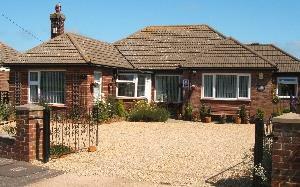 This is available with the bungalow only by prior arrangements with the Agents.